SANICLE: The American herbal practitioner, Jethro Kloss, in his monumental work "Back to Eden," aptly describes Sanicle in this manner: "This is one of the herbs that could be called a cure-all, because it possesses powerful cleansing and healing virtues both internally and externally. 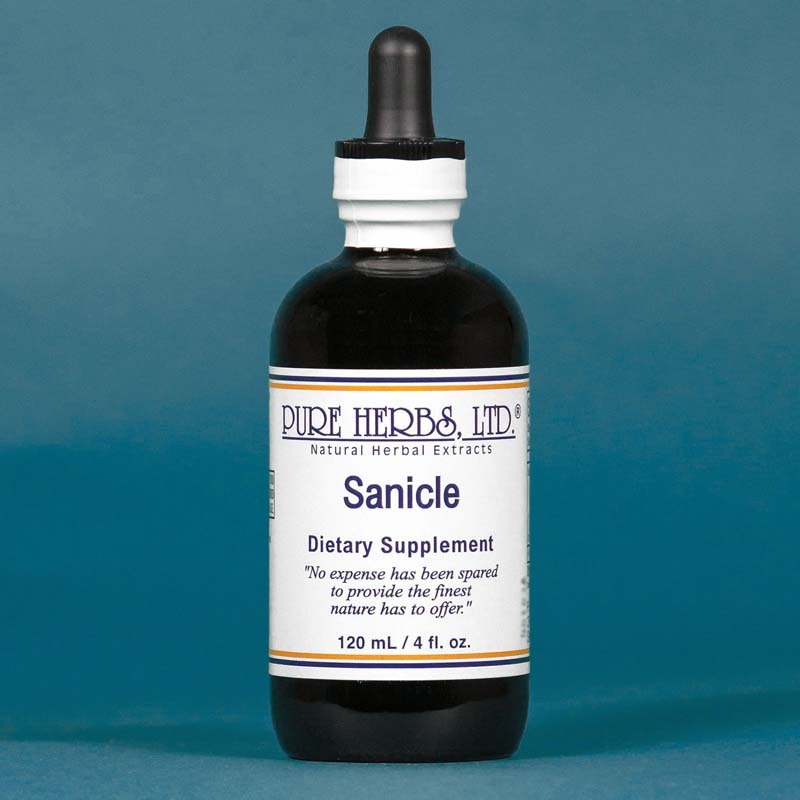 "* Sanicle's great strength includes its uncanny ability to seek out and find anything which needs correcting and works on that area first which needs it most. It also deserves distinction as a "thinking herb." In other words, if you've got it, Sanicle will find it and fix it, whether it is in the reproductive organs, brain, nervous system, lungs, throat, urinary system or elsewhere. Sanicle is a bulldozer and builder. There may be temporary discomfort when Sanicle contacts an unwanted obstruction, but it is your reassurance that Sanicle has scored a direct hit. * Skin disorders, tumors (also brain tumors), and all manner of morbid material are resolved by Sanicle. * Prolapsis of the uterus (fallen uterus), melancholy (due to toxins), thin mother's milk, morning sickness, diabetes, bee stings, and intermittent fever indicate general categories of its ubiquitous (seemingly everywhere) application. * DOSAGE: 40 drops two to three times per day. If brain tumor also apply to entire scalp, back to neck and temples. Rub one tablespoon into the scalp at night and wear a shower cap. Wash off in the morning. During day rub Herbal Adjustment into scalp 3 times per day.